There is no doubt that Gadang is a company on the run, however I would like to highlight misleading statement after misleading statement given by a well-followed guy. 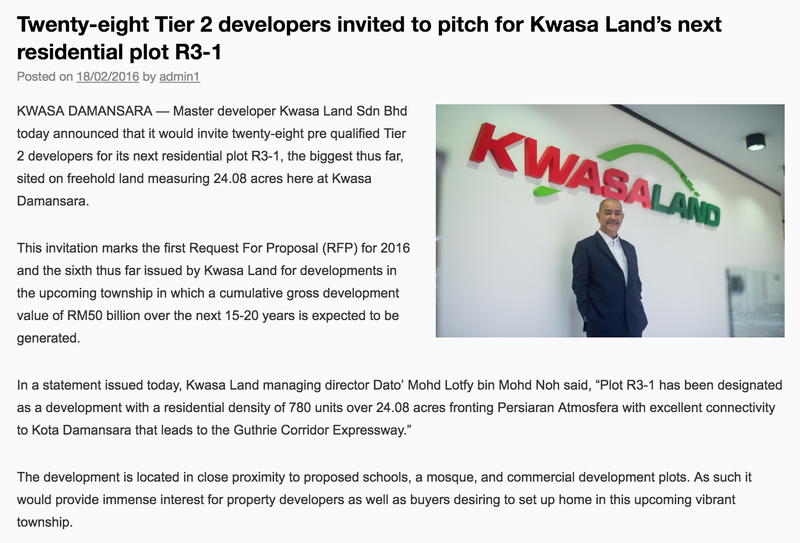 This statement is as if Gadang has the right over the entire development at Kwasa Land. He says, if there is no market for houses and condominiums, Gadang will not build while the land continues to appreciate in value - utterly misleading. Here is what the Gadang has won in its bidding. Gadang has won bid over a 24.08 acre of land. The entire Kwasa Land is 2,330 acre of land. There is no doubt that from what is presented by Kwasa Land, it is a prime land but the piece is only 24.08 acre - not the entire development. I am sure that the award from Kwasa comes with condition. Gadang will not have 20 years to develop the piece - I can vouch for that despite not needing to read anything from Gadang. It does not matter how old the person is and if he has no intention to cheat - but the writing is very misleading. I am sorry as I cannot take it this time. Here is the details of the award, where is it mentioned of Gadang getting the entire development? If one is to write, it has to be with great responsibility. Purely misleading and trying to milk using manipulated info..